What’s it like: Giorgio Locatelli’s presence is definitely seen in the menu at his establishment, and with the announcement of the spring menu, featuring seasonal ingredients such as white asparagus, we knew we had to try it. Located in one of Dubai’s iconic hotspots, Atlantis The Palm, the restaurant was bustling even on a Monday night. The warm, rustic vibe offered a great pick-me-up for my weekday blues. 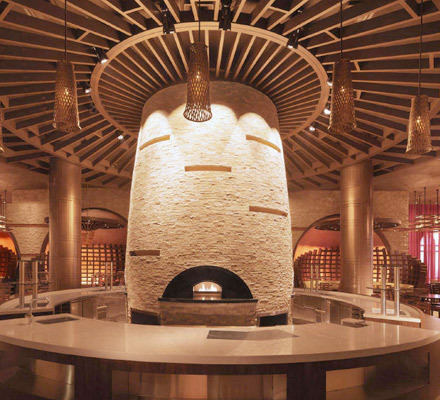 The restaurant’s focal point is the wood-fired brick oven, which was mostly surrounded by children, eager to see their pizzas being made in front of their eyes. After tucking into the basket of fresh breads, we turned to the helpful wait staff for advice on what to order. To begin with, my partner and I ordered the Fritto misto – Italian tempura fried zucchini and vegetables, which had the perfect crunch – and Burrata with pickles, which we devoured in minutes. The burrata was fresh, gooey and absolutely divine – a definite highlight of the meal. For mains, the seafood platter came recommended, but we also wanted to try the Tender beef with white asparagus and Marsala sauce from the spring menu, so we opted to share both! While the beef wasn’t my favourite, my partner enjoyed it, as it was cooked to his liking. I, on the other hand, loved the subtle sweetness in the white asparagus. The seafood platter had everything from lobster and tiger prawns to squid and tuna steaks, with the lobster being another favourite as every bite was juicy and tender. We were unsure about dessert, but after a look at the menu and recommendations from the staff, we decided to share the limoncello ice cream dessert with berries, which was light and refreshing, with its citrussy flavours. If you want to go: Approximate price for dinner for two is Dhs800, without drinks. Call 04-4262626.